Saint Dominic saw the need for a new type of organization to address the needs of his time. The Dominican Order, originally known as the Order of Preachers, is a Catholic religious order created by Saint Dominic in the early thirteenth century in France. Dominic established his religious community in Toulouse in 1214, officially recognized as an order by Pope Honorius III in 1216. Founded under the Augustinian rule, the Dominican Order is one of the great orders of mendicant friars that revolutionized religious life in Europe during the High Middle Ages. However, it notably differed from the Franciscan Order in its attitude toward ecclesiastical poverty. Established to preach the Gospel and to combat heresy, the order is famed for its intellectual tradition, having produced many leading theologians and philosophers. It played a leading role in investigating and prosecuting heresy during the Inquisition. Important Dominicans include Saint Dominic, St. Thomas Aquinas, Albertus Magnus, St. Catherine of Siena, and Girolamo Savonarola. Four Dominican cardinals have become popes. In England and some other countries the Dominicans are referred to as Blackfriars on account of the black cappa or cloak they wear over their white habits. In France, the Dominicans are also known as Jacobins, because their first convent in Paris bore the name "Saint Jacques," or Jacobus in Latin. They have also been referred to using a Latin pun, as "Domini canes," or "The Hounds of God," a reference to the order's reputation as most obedient servants of the faith, sometimes with a negative connotation or reference to the order's involvement with the Inquisition. 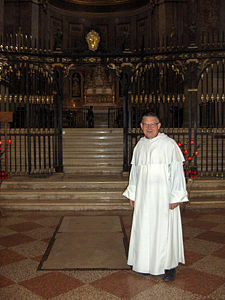 The Dominican Order is headed by the Master of the Order, who is currently Brother Carlos Azpiroz Costa. Members of the order often carry the letters O.P. after their name. Dominic saw the need to establish a new kind of order when traveling through the south of France when that region was the stronghold of heretical Albigensian thought—also known as Catharism—centered around the town of Albi. To combat heresy and other problems in urban areas, he sought to establish an order that would bring the systematic education of the older monastic orders such as the Benedictines to bear on the religious problems of the burgeoning population of cities. His was to be a preaching order, trained to preach in the vernacular languages, but with a sound background in academic theology. Rather than earning their living on vast farms as the monasteries had done, the new friars would survive by persuasive preaching and the alms-giving of those who heard them. They were initially scorned by more traditional orders, who thought these "urban monks" would never survive the temptations of the city. The Dominicans were thus set up as the branch of the Catholocism Church to deal with heresy. The organization of the Order of Preachers was approved in December 1216 by Pope Honorius III. 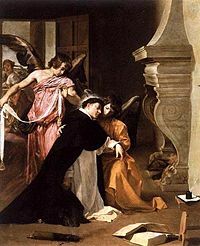 St. Thomas Aquinas, considered by the Catholic Church to be its greatest theologian, is girded by angels with a mystical belt of purity after his proof of chastity. The thirteenth century is the classic age of the order. It reached all classes of Christian society fighting heresy, schism, and paganism. Its schools spread throughout the entire Church. Its doctors wrote monumental works in all branches of knowledge and two among them, Albertus Magnus, and especially Thomas Aquinas, founded a school of philosophy and theology which was to rule the ages to come in the life of the Church. An enormous number of its members held offices in both Church and state—as popes, cardinals, bishops, legates, inquisitors, confessors of princes, ambassadors, and paciarii (enforcers of the peace decreed by popes or councils). A period of relaxation ensued during the fourteenth century owing to the general decline of Christian society. The weakening of doctrinal activity favored the development of the ascetic and contemplative life sprang up, especially in Germany and Italy, an intense and exuberant mysticism with which the names of Meister Eckhart, Heinrich Suso, Johannes Tauler, and St. Catherine of Siena are associated, which has also been called "Dominican mysticism." This movement was the prelude to the reforms undertaken at the end of the century, by Raymond of Capua, and continued in the following century. It assumed remarkable proportions in the congregations of Lombardy and the Netherlands, and in the reforms of Girolamo Savonarola at Florence. Savonarola, an Italian Dominican priest and leader of Florence from 1494 until his execution in 1498, was known for religious reform, anti-Renaissance preaching, book burning, and destruction of what he considered immoral art. He vehemently preached against what he saw as the moral corruption of the clergy, and his main opponent was Pope Alexander VI. He is sometimes seen as a precursor of Martin Luther and the Protestant Reformation, though he remained a devout and pious Roman Catholic during his whole life. The Order found itself face to face with the Renaissance. It struggled against what it believed were the pagan tendencies in humanism, but it also furnished humanism with such advanced writers as Francesco Colonna and Matteo Bandello. Its members, in great numbers, took part in the artistic activity of the age, the most prominent being Fra Angelico and Fra Bartolomeo. Saint Dominic presiding at an inquisition. Although the painting is anachronistic, the Dominicans indeed played a leading role in the Inquisition. The Dominican Order was instrumental in the Inquisition. In the twelfth century, to counter the spread of Catharism, prosecution against heresy became more frequent. As the Dominicans were particularly trained in the necessary skills to identify heretics and deal with them, in the thirteenth century, the Pope assigned the duty of carrying out inquisitions to the Dominican Order. Dominican inquisitors acted in the name of the Pope and with his full authority. The inquisitor questioned the accused heretic in the presence of at least two witnesses. The accused was given a summary of the charges and had to take an oath to tell the truth. Various means were used to get the cooperation of the accused. Although there was no tradition of torture in Christian canon law, this method came into use by the middle of the thirteenth century. The findings of the Inquisition were read before a large audience; the penitents abjured on their knees with one hand on a bible held by the inquisitor. Penalties went from visits to churches, pilgrimages, and wearing the cross of infamy to imprisonment (usually for life but the sentences were often commuted) and (if the accused would not abjure) death. Death was by burning at the stake, and was carried out by the secular authorities. In some serious cases when the accused had died before proceedings could be instituted, his or her remains could be exhumed and burned. Death or life imprisonment was always accompanied by the confiscation of all the property of the accused. The Dominicans were sent as inquisitors in 1232 to Germany along the Rhine, to the Diocese of Tarragona in Spain and to Lombardy; in 1233 to France, to the territory of Auxerre; the ecclesiastical provinces of Bourges, Bordeaux, Narbonne, and Auch, and to Burgundy; in 1235 to the ecclesiastical province of Sens. 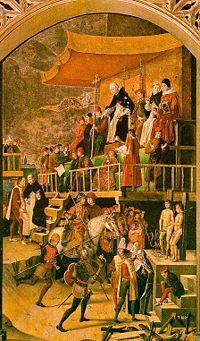 By 1255, the Inquisition was in full activity in all the countries of Central and Western Europe—in the county of Toulouse, in Sicily, Aragon, Lombardy, France, Burgundy, Brabant, and Germany. The fifteenth century witnessed Dominican involvement in the Spanish Inquisition. Alonso de Hojeda, a Dominican from Seville, convinced Queen Isabella of the existence of Crypto-Judaism among Andalusian conversos during her stay in Seville between 1477 and 1478. A report, produced at the request of the monarchs by Pedro González de Mendoza, Archbishop of Seville and by the Segovian Dominican Tomás de Torquemada, corroborated this assertion. The monarchs decided to introduce the Inquisition to Castile to uncover and do away with false converts. The Spanish Inquisition brought the deaths of many Jews found to be insincere in their conversions and resulted in the expulsion of the Jewish from Spain in 1492. In 1542, Pope Paul III established a permanent congregation staffed with cardinals and other officials whose task it was to maintain and defend the integrity of the faith and to examine and proscribe errors and false doctrines. This body, the Congregation of the Holy Office (now called the Congregation for the Doctrine of the Faith), became the supervisory body of local inquisitions. In the Middle Ages, theological debates took place at the University of Paris between the Aristotelian Dominicans and the Franciscan Platonists. Many of these encounters lacked what could be called Christian love in their search for truth. The Franciscans made themselves felt alongside of the Dominicans, and created a rival school of theology as contrasted with the Aristotelianism of the Dominican school. As a result, the Paris theology faculty protested the use of Aristotle's natural philosophy (but not his logic) in the arts preparatory courses, and succeeded in having it banned in 1210. Thomas Aquinas was one of the Dominicans who articulately defended Greek learning against the objections of the Franciscans. By 1255, however, Aristotle won the day it became apparent that students would start going elsewhere to study Aristotle if they could not get it in Paris. In the Franciscan versus Dominican rivalry, pointed differences also occurred on the Mendicant Orders: the Dominicans adopted the existing monastic rule, while the Franciscans did not allow personal property. After the death of the founders, St. Dominic and St. Francis, re-discussions and reinterpretations of the notion of poverty continued. The quarrel continued for some 70 years and was at times extremely bitter. Bartolomé de Las Casas became famous for his advocacy of the rights of Native Americans, whose cultures, especially in the Caribbean, he describes with care. At the beginning of the sixteenth century, the progress of the Protestant "heresy" in Europe and Britain cost the Order six or seven provinces and several hundreds of convents. Queen Mary I of England (r. 1553-1558) used the Dominicans in her effort to reverse the Protestant Reformation, an effort which proved futile. In spite of these setbacks, the discovery of the New World opened up a fresh field of missionary activity. One of the most famous Dominicans of this period was Bartolomé de Las Casas, who argued forcefully for the rights of Native Americans in the Caribbean. The order's gains in America, the Indies and Africa during the period of colonial expansion far exceeded the losses of the order in Europe, and the seventeenth century saw its highest numerical development. In modern times, the order lost much of its influence on the political powers, which had universally fallen into absolutism and had little sympathy for the democratic constitution of the Preachers. The Bourbon courts of the seventeenth and eighteenth centuries were particularly unfavorable to them until the suppression of the Society of Jesus (the Jesuits). In the eighteenth century, there were numerous attempts at reform which created, especially in France, geographical confusion in the administration. Also during the eighteenth century, the tyrannical spirit of the European powers and the spirit of the age lessened the number of recruits and the fervor of religious life. The French Revolution ruined the order in France, and the crises which more or less rapidly followed considerably lessened or wholly destroyed numerous provinces. In the beginning of the nineteenth century the number of Preachers reached a low of around 3,500. The French restoration, however, furnished many Preachers to other provinces, to assist in their organization and progress. From it came Père Vincent Jandel (1850-1872), who remained the longest-serving master general of the nineteenth century. The province of St. Joseph in the United States was founded in 1805 by Father Edward Fenwick, the first Bishop of Cincinnati, Ohio (1821-1832). Afterwards, this province developed slowly, but now ranks among the most flourishing and active provinces of the Order. In 1910, the Order had 20 archbishops or bishops, and a total of 4,472 both nominally and actually engaged in the activities of the Order. Since that year, the Order has published an important review in Madrid, La Ciencia Tomista. 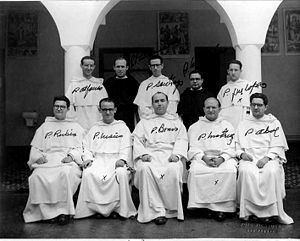 French Dominicans founded and ran the French Biblical and Archæological School of Jerusalem, one of the leading international centers for Biblical research of all kinds. It was here that the famed Jerusalem Bible (both editions) was prepared. Likewise, Yves Cardinal Congar, O.P., one of the emblematic theologians of the twentieth century, was a product of the French province of the Order of Preachers. In 1992, the followers of St. Dominic from 90 countries sent representatives to the General Chapter of 1992 in Mexico. They were engaged in every imaginable work, from running an ecological farm in Benin to exploring Coptic verbs in Fribourg, Germany. Recent General Chapters have tried to help the Order focus its priorities in face of such endless demands and possibilities. In particular, the apostolic commitment aims to achieve four main objectives: intellectual formation, world mission, social communication, and justice. Study: Dominican tradition and heritage of study is freedom of research. 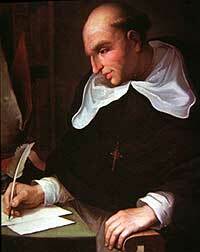 Dominic set study in the service of others as his ideal when he made study an integral part of the life of the Order. Study and concern was focused on contemporary social issues, so that one would go from study of the world as it is to a commitment to envision and work for a world as it should be; to try to put right what is wrong in the world. Each person has to determine her/his own area of commitment, and then establish the desire and challenge to make this a better world. Dominic believed that you learn how to do something by doing it, not by formulating theories beforehand. Experience was the key. Prayer/Contemplation/Reflection: For example, love of the Gospel of Matthew. Community: To work for a better, more just and loving world. If we try to do this alone, we can feel overwhelmed. We can help one another—that is the point of community and family, to enable us to do what we cannot do by ourselves. These ideals developed as the Order developed under Saint Dominic and his successors. Dominic differed from founders of other religious orders of his time in that he sent his followers to engage in the life of the emerging universities of the thirteenth century. While they studied, they realized that there must be a spirit of prayer, contemplation, and reflection that would connect the world of ideas, the life of the mind, and the spirit of truth, to the reality of the goodness of the Creator. This reflection and prayer could not be done in a vacuum, but must be done in and through the sharing of communal life. Coming full circle, the Dominicans were commissioned to share their knowledge and love of God with the people of the world. Thus, the Order of Preachers continues to share the Good News of the Gospel through the service and ministry they perform. As well as the friars, Dominican sisters, also known as the Order of Preachers, live their lives supported by four common values, often referred to as the Four Pillars of Dominican Life, they are: community life, common prayer, study and service. St. Dominic called this fourfold pattern of life the "holy preaching." Henri Matisse was so moved by the care that he received from the Dominican Sisters that he collaborated in the design and interior decoration of their Chapelle du Saint-Marie du Rosaire in Vence, France. 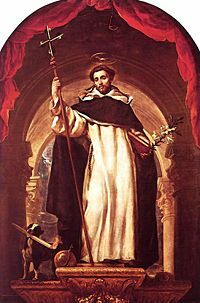 Important Dominicans include: Saint Dominic, St. Thomas Aquinas, Albertus Magnus, St. Catherine of Siena, St. Raymond of Peñafort, St. Rose of Lima, St. Martin de Porres, Pope Saint Pius V, Beato Jordan of Saxony, Bartolomé de las Casas, Tomás de Torquemada, and Girolamo Savonarola. Four Dominican cardinals have reached the Papacy: Innocent V, Benedict XI, Pius V, and Benedict XIII. Currently, in the College of Cardinals there are two Dominican cardinals: Christoph Cardinal Schönborn, Archbishop of Vienna; and Georges Marie Martin Cardinal Cottier. ↑ Catharism was a name given to a religious sect with gnostic elements that appeared in the Languedoc region of France in the eleventh century and flourished in the twelfth and thirteenth centuries. Catharism had its roots in the Paulician movement in Armenia and was also influenced by the Bogomiles with whom the Paulicians eventually merged. They also became influenced by dualist and perhaps Manichaean beliefs. ↑ Dominican Order website, www.op.org. Retrieved October 24, 2007. Order of Preachers - Available in English, French and Spanish. www.op.org. Dominican Life USA online news magazine – domlife.org. This page was last modified on 16 October 2017, at 19:23.